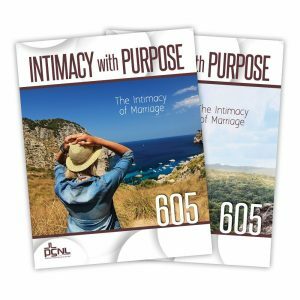 Adult & Teen Challenge USA is proud to announce the completion of the Intimacy with Purpose series, with the release of its final study: PSNL 605 – The Intimacy of Marriage! This new study provides a roadmap to healthy intimacy within marriage. Readers learn to build upon healthy intimacy with God and others, to create a safe, secure, and fruitful environment for healthy intimacy within marriage. If intimacy with God builds all relationships, how does it affect marriage? What is God’s design for intimacy in marriage? How should we approach the topic of marriage? What are healthy expectations for and motivations towards marriage? How does healthy intimacy look? How should we define it? How can we grow and guard intimacy within marriage? When we talk about intimacy in marriage, we run the risk of developing tunnel vision—focusing exclusively on sexual intimacy. While sexual intimacy is a vital and important part of intimacy in marriage, it is not the sole focus of this study. Personal Studies for New Life in Christ 105, 205, & 305 outline God’s design and purposes for healthy sexuality. This study focuses on the solution to problems and sexual issues in marriage. The solution is to develop a solid foundation upon intimacy with God. From this foundation, we can grow in intimacy with other believers—investing in discipleship and building healthy friendships and mentorships. These relationships become structural supports, helping us to become healthy and safe individuals. With this foundation and support, we cultivate an environment where intimacy in marriage can grow. But this starts within your spirit, not in the bedroom. Healthy, secure, and fun sexual intimacy within marriage is the product of a deeper internal work of the Holy Spirit in our lives. Whether you are married or single, this study will speak to you of God’s love for us. As we outline God’s plan for marriage, you will see the beauty in His design. You will be challenged to rethink how you view marriage and to test the motivations of your heart—putting selfish motives aside to build something greater. And you will learn some practical steps to guard and sustain the intimacy of marriage.